Kerala is at the southern end of the Indian peninsula. It is a part of the Western Ghats of India. Verdant with copious rainfall it is home to many trees, spice plantations, an amazing amount of flora and its well-known backwaters in the south. Kerala, often referred to as God’s own country has a very interesting history of mural making. 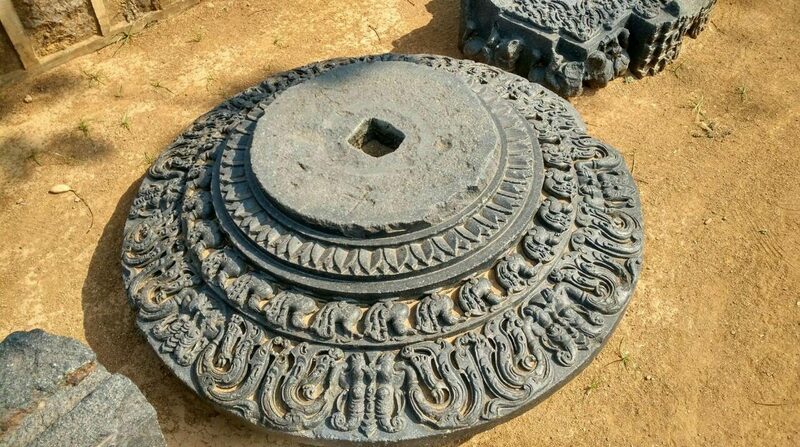 Believed to have started in the 7th and 8th century; majorly influenced by Pallava art. The oldest Kerala style murals have been found at a rock cut temple of Thirunandikara, now in Kanyakumari in Tamil Nadu which was probably made in the 9th or 10th century. There is some doubt about mural making in between 10th and 13th centuries but from the 14th to 16th century many were made and continue to this day after continuing revival efforts. The content of the murals are mostly religious and mythological depicting legends. Flora and fauna also figure in the wall paintings. Magnificent murals are found all over Kerala. Murals have been made at palaces, termples, churches and also some other spaces. The Kanthaloor temple, Thiruvananthapuram, The Mattancherry palace, Cochin, Vaddakumnathan temple, Thrissur to mention a few. Murals have been made at churches at Alappuzha, Thiruvella, Angamly and Akkaparambu. Some temple murals are highlighted here. Also some depictions from Kalyana bhavanam or marriage halls. Ananthasayanam, mural, 21st century, by artist Sastrasarman Prasad, Sree Karthyayani Temple, Kunnamkulam, Thrissur,Kerala. The Mattancheri palace was built by the Portuguese in 1555. It is commonly called Dutch palace since 1663 after the Dutch made additions and renovations to it. there are shrines in the palace compound. Next to the palace is the Cochin synagogue built in 1567. On the west of the palace are murals painted in 1000 square feet in four chambers and two low ceilinged rooms from the 17th to mid 19th century. The depictions are from the Ramayana and some Krishna-lila scenes. The eastern chambers have Lord Shiva and Vishnu depictions. The scenes are dominated by browns,golds and red browns with touches of jewel-like green. There are many paintings which include Lord Vishnu as Anantasayana, Lord Krishna lifting Mount Govardhan, Lord Shiva with Parvati on Kailasa, Krishna with gopis, marriage of Lord Shiva and Parvati. Also Lord Shiva with Vishnu as Mohini. Mural, Lord Shiva with Mohini, Parvati looking away in anger, Mattancheri palace, Cochin, Kerala. The Padmanabhapuram palace is located 40 kilometres from thiruvananthapuram, now in Tamil Nadu though historically a part of Kerala. This palace was a royal site, a centre for contact between the ruler Maharaja with visitors from abroad and for discussions with his advisors. The murals at the palace are from the 17th and 18th centuries mostly found on the upper floor of the 4 storey tower, in a sacred bedroom devoted to Lord Vishnu. Deities and tales from the Puranas are depicted on all four walls. The colours are light with uses of pastel shades and white as well. an are of 900 square feet is painted with murals. Lord Shiva resting with Parvati, Lord Krishna playing on his flute with gopis around him; are also depicted in the palace. The Krishnapuram palace, built in the early 18th century at Kayamkulam is located north of Kollam (Quilon) and has a mural of Gajendramoksham of 154 square feet made around 1725-40. There is also an image of Ganesha. At some places European influences can be seen. Gajendramoksham, Krishnapuram Palace, Kayamkulam, Alappuzha, Kerala. The magnificent art of mural painting is well depicted in many temples across Kerala. The Vaddakumnathan temple at Thrissur, the Chemmanthita Siva temple, Thrissur, Kudamaloor, Kannur, Thodeekkalam, Kannur, the Sreevallabha temple, Thiruvalla the Mahadeva Siva temple, Ettamanoor, Pallikarup Mahavishnu temple, Mannarkad, Palakkad, the Padmanabhaswamy temple at Thiruvananthapuram, Guruvayur temple, Guruvayur, Vaikom temple, Kottayam, among many others. The Sreevallabha temple at Thiruvalla, Pathanamthitta is dedicated to Lord Sree Vallabham and is very old. It is built on the banks of the Manimala river. The temple has fine stone-wooden carvings and grand architecture. There are superb murals paintings in the sreekovil (sanctum sanctorum) of Matsya avatara, Kurma, Varaha, Narasimha, Vamana, Sudarshana, Parashurama, Venugopala, Lord Krishna, Kaaliyamardana episode, Balarama, Dakshinamurty, Purusha sukta, Lord Rama, Lakshmi, Ganapati, Kalki avatara. Garuda, mural, Sreevallabha temple, Thiruvalla, Kerala. The Vaikom Mahadeva temple in Kottayam is an elliptical plan temple founded in the 11th or 12th century. The murals here are dedicated to the story of Lord Shiva. The paintings are bright and the colours are intense. At the Mahadeva temple at Ettamanur in Kottayam is an awesome panel of Lord Shiva as Nataraja on the inner wall of the gopura, 12 feet by 8 feet in size from the 16th century ! Lord Shiva is seen trampling the demon apasmara. Vaikom Mahadeva Temple, Kottayam, Kerala. The Thodeekkalam Shiva temple at Kannur is believed to be 2000 years old ! It is having much admired murals which depict stories of Lord Shiva and Lord Vishnu. Also the rural life from the 16th to the 18th centuries. The two-storied temple associated with the Pazhassi royal family of Kottayam, has 150 murals painted over an area of 700 square feet on the walls of the garba-griha or sanctum sanctorum. The splendorous murals are painted with naturally sourced pigments and red, saffron-yellow, green, white, blue, black, golden yellow hues dominate the panels. Mural painting of Ganesha, Thodeekkalam Shiva temple, Kannur,Kerala. Mural painting, Thodeekkalam Shiva temple, Kannur, Kerala. The Pundareekapuram temple near Thalayolaparambhu in Kottayam has Lord Vishnu as the main deity on his Garuda along with Bhoodevi. The murals of this temple were made most probably in later 18th century. The themes include Mahisasuramardini, Krishnalila, Sri Rama-pattabhishekam among others. The murals are bold and striking with accurate lines. Many images of Nagaraja along with Garuda are found in the temple. Pundareekapuram temple mural, Kottayam, Kerala. Kalyana-bhavanam mural painting, Achikanam, Kasargod, Kerala. Mural at Olavakhode Railway Station, Palakkad, Kerala. Temple arts of Kerala/Bernier,Ronald M, New Delhi : S Chand & Company Ltd, 1982. This entry was posted in art history of India, asian art, Kerala, mural painting of Kerala, Mural paintings of India, Temple art of India and tagged art history, Kerala, murals of Kerala, Temple art of India, Temples on January 1, 2018 by historyreads. The story of Shakuntala and King Dushyanta is from the Indian epic Mahabharata and retold by poet Kalidasa in his Abhignanashakuntalam . It is a very popular story in India. Shakuntala was born to apsara Menaka and Sage Viswamitra. Viswamitra however refused to accept the child. Sage Kanva found her in a forest and surrounded by shakunta birds. 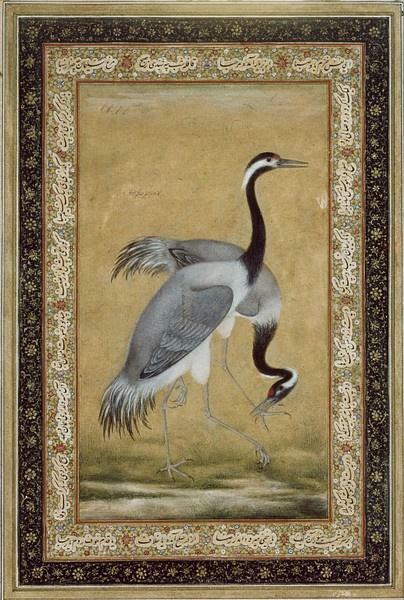 He named her Shakuntala; on who is protected by shakunta birds. Shakuntala grew up to be beautiful damsel. One day King Dushyanta who the son of Ilina and Rathantara and king of Hastinapur and ancestor of the Kurus; was travelling through the forest with his entourage and trying to hunt down a male deer. He meets Shakuntala and both fall in love with each other. He spends time with her and they have a Gandharva marriage. Before leaving back for his royal duties, he gives Shakuntala his royal ring, promising he would return to take her to his palace. During Dushyanta’s absence Shakuntala kept dreaming about him. One day while she was lost in thoughts of Dushyanta, Sage Durvasa came to the ashram where she lived, but Shakuntala did not greet him properly. He cursed her saying that the person she was thinking about would forget her. Immediately her friends came and intervened and the sage modified his curse saying that he would remember on showing a personal token given to her. Much time passed but King Dushyanta did not come to take her. She along with some companions set out for the city along with age Kanva. On the way they had to cross ariver by a boat and finding the blue water, Shakuntala ran her hand through it. The ring given by Dushyanta slipped out of her finger without her realising it. She reached Dushyanta’s court but he failed to recognise her. 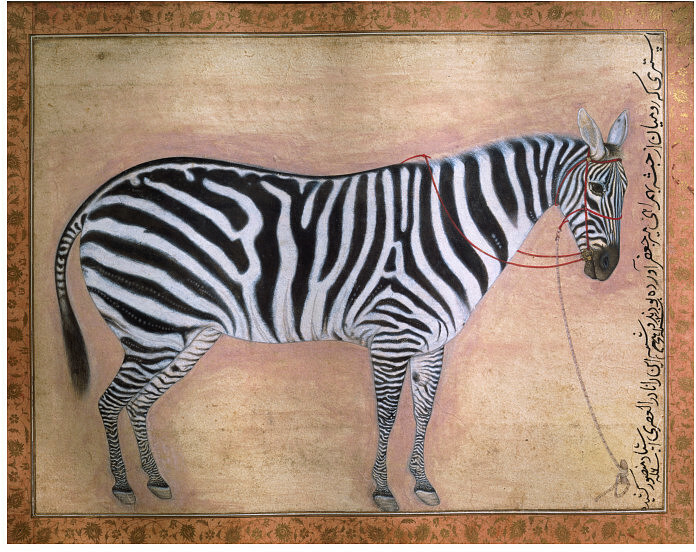 Her ring too had gone missing so Shakuntala had to return. She was devastated by the happenings and in grief settled in the wild forest along with her son Bharata. Bharata, surrounded only by wild animals, grew to be a strong youth and made a game of opening the mouths of tigers and lions to count their teeth. However fate had other plans. The ring was swallowed by a fish. A fisherman was surprised to see a royal ring in the stomach of a fish and took it to the palace. On seeing the ring, King Dushyanta recalled everything ! He set out for the forest and came to the ashram where Shakuntala used to live. On not finding her, he started roaming in the wild forest looking for her. He came upon a young boy who was playing with lion cubs. He asked him his name. He replied saying he was Bharata, King Dushyanta’s son. The king was very happy and the boy led him to his beautiful bride Shakuntala and the family was reunited. Some different versions of the story too exist and has been retold by many authors. According to one version apsara Menaka takes Shakuntala to heaven after Dushyanta fails to recognise her and Bharata is born there. King Dushyanta then had to fight with the devas to get her back along with his son Bharata. Bharata is believed to have become the emperor who founded the Bharata dynasty of India and the name Bharatvarsha is after the same dynasty. Birth of Shakuntala,painting, Raja Ravi Varma,19th century. Shakuntala,painting, Raja Ravi Varma,19th century. 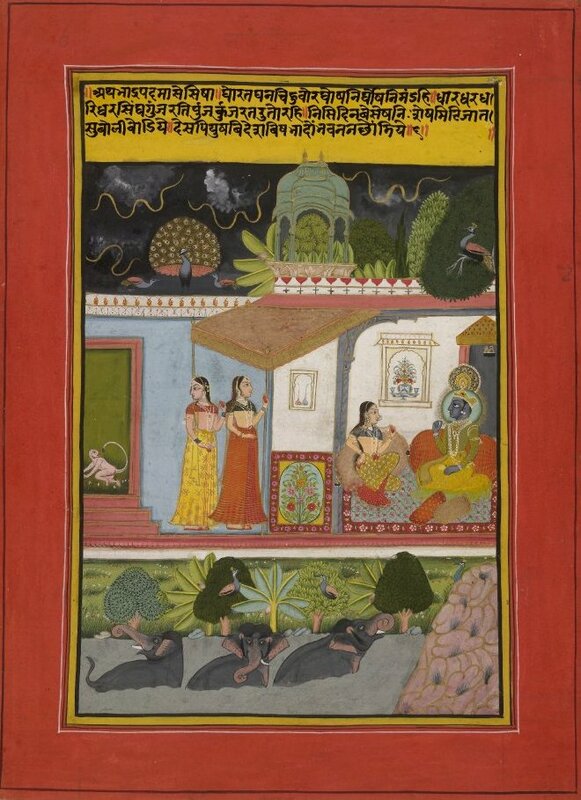 Dushyant and Shakuntala in a landscape, folio from a Mahabharata, 1800, Kangra,Himachal Pradesh. Dushyant and Shakuntala, print, 1940s. Shakuntala,painting,Raja Ravi Varma, 19th century. Sage Durvasa cursing Shakuntala, lithograph, 1895. Shakuntala writing letter to Dushyant,painting, Raja Ravi Varma, 19th century. Apsara Menaka taking her daughter Shakunthala to heaven, painting,Raja Ravi Varma,19th century. Bharat playing with lion cubs,illustration,20th century. This entry was posted in Ancient Indian history, art history, Dushyanta, miniature paintings, Raja Ravi Varma, Shakuntala and tagged Ancient Indian history, art history of India, Bharata, Dushyanta, Shakuntala on February 6, 2017 by historyreads. Rama is the main protagonist in the great Indian epic, Ramayana of Hinduism. Rama is believed to be the seventh avatar of Vishnu from the Hindu trinity of Brahma, Vishnu and Shiva.The Ramayana is the story of his ideals, his greatness, his life events, his marriage, his exile, the abduction of his wife Sita and his battle with Ravana. Scriptures and texts based on the Ramayana exist in many cultures in south Asia. Rama was the eldest son of King Dasaratha and Kaushalya of Kosala (area in present day Uttar Pradesh). Rama is considered to be a perfect man and Sita is considered to be an avatar of Goddess Lakshmi and a great woman. Rama is revered for his exemplary courage and devotion to religious values, dharma. Lord Rama faces many obstacles and hardships in his life, serves an exile of fourteen arduous years in the forest along with his wife Sita and brother Lakshmana. During this time ,Sita is abducted by Ravana, the king of Lanka. After a long search and with the help of Hanuman, his devotee, she if found there and after a colossal battle with monkey armies where Ravana is killed, he frees Sita. He finally returns to Ayodhya and is crowned to rule with justice and prosperity ; the period is called Rama-rajya. Lord Rama is known by other names as Raghava, Raghunandan, Siyavaara, Dasarathaputra, Maryada-purushottama among others. Lord Rama,painting, probably Thanjavur or Tiruchirapally,Tamil Nadu,early 19th century. The epic Ramayana is composed by the sage Valmiki. The Bhagavata purana retells the events up to the defeat of Ravana and Rama’s coronation in Ayodhya. As per the Vishnu purana, Lord Rama is the seventh avatar of Vishnu.The stories of Rama are mentioned in the Mahabharata too. In Buddhist texts the Dasaratha Jataka mentions Rama. Sita,also known as Siya, Vaidehi, Janaki, Maithili or Bhoomija, is the wife of Rama in Ramayana. She is the daughter of King Janaka of Videha and his wife Sunaina. She is revered for her feminine virtues,dedication, self-sacrifice, courage and purity.Sita has been a much revered figure amongst the Hindus. She has been portrayed as an ideal daughter, an ideal wife and an ideal mother in various texts and stories. Sita is often worshipped with Rama as his consort, as Ram-Sita. Marriage of Rama and his brothers,Mandi artists,1750. Rama taking leave of Dasaratha,painting,late 16th century. Rama,Sita and Lakshmana in exile,painting,19th century. Ravana visiting Sita as an ascetic,oleograph,19th century. 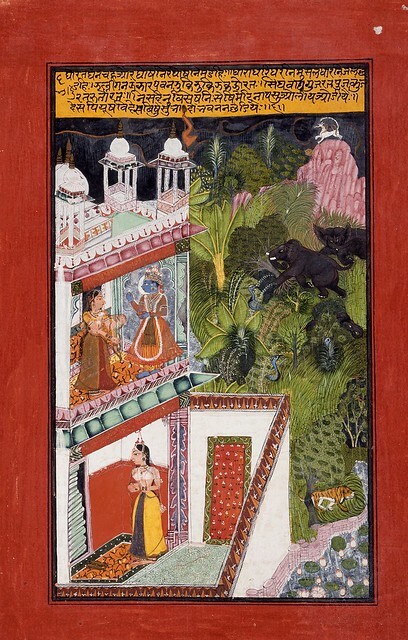 Ravana approaching Sita during her captivity,painting,20th century. Various versions of the Ramayana exist in major Indian languages. In Tamil the epic poem Ramavataram by 12th century poet Kambar, the Ramcharitmanas by Tulsidas in the 16th century in Hindi have been celebrated. Some contemporary versions too have gained importance like Shri Ramayana darshanam by Kuvempu in Kannada and Ramayana kalpavriksham by Viswanatha Satyanarayana in Telugu. Ancient sources say that Rama was born in the end of Tretayuga ,880 thousand years ago. However Ramayana in its current form is dated to 7th-4th century B.C. Rama,Sita and Lakshmana at Rishi Bharadwaj ashram, painting, Kangra,Himachal Pradesh,18th century. Lakshmana and Sita leave Ayodhya,painting,Kangra, early 19th century, Honolulu Academy of Arts,USA. Sita during agnipariksha, painting, Mughal school,1600s. Rama,Lakshmana and Sita setting up their house at Panchavati, illustration,Mewar,17th century. Rama and Sita, Kalighat painting, 19th century,Kolkata. This entry was posted in Ancient Indian history, art history, asian art, miniature paintings, Ram-Sita, Rama, Sita and tagged Ancient Indian history, art history, Ram-Sita, Rama, Sita on February 1, 2017 by historyreads.